Augusta is the capital of the US state of Maine, county seat of Kennebec County, and center of population for Maine. The city's population was 19,136 at the 2010 census, making it the third-smallest state capital after Montpelier, Vermont and Pierre, South Dakota. Located on the Kennebec River at the head of tide, it is home to the University of Maine at Augusta. The area was first explored by the ill-fated Popham Colony in September 1607. It was first inhabited by English settlers from the Plymouth Colony in 1629 as a trading post on the Kennebec River. The settlement was known by its Indian name—Cushnoc (or Coussinoc or Koussinoc), meaning "head of tide." Fur trading was at first profitable, but with Indian uprisings and declining revenues, the Plymouth Colony sold the Kennebec Patent in 1661. Cushnoc would remain unoccupied for the next 75 years. A hotbed of Abenaki hostility toward British settlements was located further up the Kennebec at Norridgewock. In 1722, the tribe and its allies attacked Fort Richmond (now Richmond) and destroyed Brunswick. In response, Norridgewock was sacked in 1724 during Dummer's War, when English forces gained tentative control of the Kennebec. In 1754, a blockhouse named Fort Western (now the oldest wooden fort in America), was built at Cushnoc on the eastern bank. It was intended as a supply depot for Fort Halifax upriver, as well as to protect its own region. In 1775, Benedict Arnold and his 1,100 troops would use Fort Western as a staging area before continuing their journey up the Kennebec to the Battle of Quebec. Cushnoc was incorporated as part of Hallowell in 1771. Known as "the Fort", it was set off and incorporated by the Massachusetts General Court in February 1797 as Harrington. In August, however, the name changed to Augusta after Augusta Dearborn, daughter of Henry Dearborn. In 1799, it became county seat for newly created Kennebec County. Maine became a state in 1820 and Augusta was designated its capital in 1827. The Maine State Legislature continued meeting in Portland, however, until completion in 1832 of the new Maine State House designed by Charles Bulfinch. Augusta was chartered as a city in 1849. After being named the state capital and the introduction of new industry, the city flourished. In 1840 and 1850, the city ranked among the 100 largest urban populations. The next decade, however, the city was quickly bypassed by rapidly growing metropolises in the Midwest. Excellent soil provided for agriculture, and water power from streams provided for industry. In 1837, a dam was built across the Kennebec where the falls drop 15 feet at the head of tide. By 1838, 10 sawmills were contracted. With the arrival of the Kennebec & Portland Railroad in 1851, Augusta became an even more productive mill town. In 1883, the property of A. & W. Sprague Company was purchased by the Edwards Manufacturing Company, which erected extensive brick mills for manufacturing cotton textiles. In the late 19th century, a paper and pulp plant was constructed. Other Augusta firms produced lumber, sash, doors, window shutters, broom handles, stone cutters' tools, shoes, headstones, ice and furniture. The city developed as a publishing and shipping center. Today, government and post-secondary education are important businesses. In the 19th century, Augusta got a regular steamboat service and the railroad. The city installed gas lights in 1859. A telephone service was available in 1880 and a local hospital in 1898. In the early 20th century, Augusta built two movie houses and a film production studio. 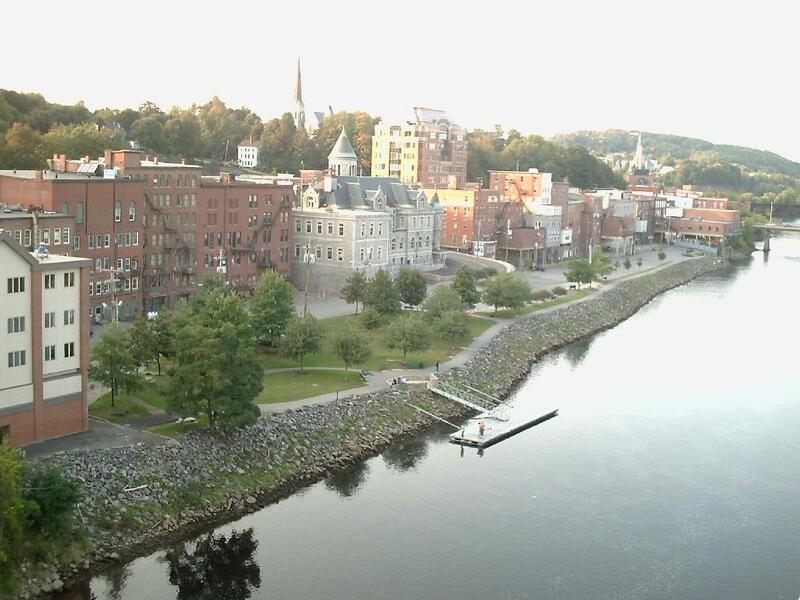 For much of Augusta's history, the central business district was on and near Water Street on the west bank of the Kennebec River. The street, laid out in the late 1700s, was also the location of many of the government buildings. As the city grew and spread out the local government buildings moved further away from the business district. Many fires damaged this concentrated area, including one significant fire in 1865 that destroyed nearly 100 buildings. In 1890, the first trolley line began operation down Water Street, connecting Augusta with Gardiner and Hallowell to the south. In 1932, buses replaced the trolley line. With the completion of the Maine Turnpike and Interstate 95 in 1955, local commercial developments began to move away from Water Street and closer to the highway. Since the 1980s, there has been an attempt by city officials to revitalize the downtown area. Surviving mill and factory buildings have been redeveloped into housing. The dam on the Kennebec was removed in 1999 and the area around the dam has been turned into a city park. The city hall and other local government departments were relocated to the eastern bank of the river in the 1980s. Since the mid-eighteenth century, there has been a military presence in Augusta. Fort Western has not had troops garrisoned there since the 1790s, but in 1828, the U.S. Government built an arsenal to protect their interests from Britain. During the Civil War, Augusta was a rendezvous point for soldiers traveling to the front. Many of the soldiers camped on the green in front of the capitol building. In 1862, Camp E.D. Keyes was established in the northwestern portion of the city. During World War I, Camp Keyes was used as a mobilization and training camp for soldiers. The camp eventually became a headquarters for the Maine National Guard. In 1929, the state legislature approved the placement of the Augusta State Airport next to the camp. As the airport grew, the use of the camp as a training facility was no longer possible. Today, it is still used for administrative and logistical purposed for the National Guard. Augusta is located at 44°19′25″N 69°45′55″W﻿ / ﻿44.32361, -69.76528,  making it the easternmost state capital in the United States. According to the United States Census Bureau, the city has a total area of 58.03 square miles (150.30 km2), of which 55.13 square miles (142.79 km2) is land and 2.90 square miles (7.51 km2) is water. Augusta is drained by Bond's Brook, Woromontogus Stream and the Kennebec River. The city is crossed by Interstate 95, US Route 201, State Route 11, US Route 202, State Route 9, State Route 3, State Route 100, State Route 27, State Route 8, State Route 104, and State Route 105. Augusta borders the towns of Manchester to its west, Sidney and Vassalboro to its north, Windsor to its east, Chelsea to its south, and the city of Hallowell to its southwest. Augusta's climate is classified as a humid continental climate (Köppen: Dfb). Summers are typically warm, rainy, and humid, while winters are cold, windy, and snowy. Spring and fall are usually mild, but conditions are widely varied, depending on wind direction and jet stream positioning. The hottest month is July, with an average high temperature of 80 °F (26.7 °C). The coldest month is January, with an average low of 10 °F (−12.2 °C). Most snowfall occurs from December through March. There is usually little or no snow in April and November, and snow is rare in May and October. As of the census of 2010, there were 19,136 people, 8,802 households, and 4,490 families residing in the city. The population density was 347.1 inhabitants per square mile (134.0 /km2). There were 9,756 housing units at an average density of 177.0 per square mile (68.3 /km2). The racial makeup of the city was 94.1% White, 1.1% African American, 0.7% Native American, 1.5% Asian, 0.1% Pacific Islander, 0.4% from other races, and 2.3% from two or more races. Hispanic or Latino of any race were 1.8% of the population. There were 8,802 households of which 23.0% had children under the age of 18 living with them, 35.2% were married couples living together, 11.8% had a female householder with no husband present, 4.0% had a male householder with no wife present, and 49.0% were non-families. 39.8% of all households were made up of individuals and 13.6% had someone living alone who was 65 years of age or older. The average household size was 2.08 and the average family size was 2.76. The median age in the city was 43.2 years. 18.3% of residents were under the age of 18; 8.1% were between the ages of 18 and 24; 26% were from 25 to 44; 29.4% were from 45 to 64; and 18% were 65 years of age or older. The gender makeup of the city was 48.6% male and 51.4% female. As of the census of 2000, there were 18,560 people, 8,565 households, and 4,607 families residing in the city. The population density was 335.1 people per square mile (129.4/km²). There were 9,480 housing units at an average density of 171.2 per square mile (66.1/km²). The racial makeup of the city was 96.21% White, 0.50% Black or African American, 0.48% Native American, 1.35% Asian, 0.01% Pacific Islander, 0.16% from other races, and 1.3% from two or more races. 0.86% of the population were Hispanic or Latino of any race. There were 8,565 households out of which 24.3% had children under the age of 18 living with them, 39.1% were married couples living together, 10.9% had a female householder with no husband present, and 46.2% were non-families. 38.3% of all households were made up of individuals and 14.2% had someone living alone who was 65 years of age or older. The average household size was 2.10 and the average family size was 2.77. In the city, the population was spread out with 20.5% under the age of 18, 8.7% from 18 to 24, 28.3% from 25 to 44, 24.8% from 45 to 64, and 17.7% who were 65 years of age or older. The median age was 40 years. For every 100 females there were 89.9 males. For every 100 females age 18 and over, there were 87.5 males. The median income for a household in the city was $29,921, and the median income for a family was $42,230. Males had a median income of $31,209 versus $22,548 for females. The per capita income for the city was $19,145. About 11.4% of families and 15.0% of the population were below the poverty line, including 19.2% of those under age 18 and 9.8% of those age 65 or over. Augusta is governed by a Mayor and council-manager system. The City Council oversees all City government activities and establishes the legislative policies of the City, adopts and amends ordinances and local laws, appropriates municipal resources, and sets the tax rate. The City Manager serves as the chief executive officer and purchasing agent of the city. The Mayor presides at all meetings of the council, and is recognized as the official head of the city. The city maintains a police department remarkable for having not had an officer killed in the line of duty for over a century. Augusta has historically been Democratic. In the 2012 Presidential election, Barack Obama received 5,192 of the votes to Mitt Romney's 3,339. The City has not voted for a Republican presidential candidate since the Republican landslide of 1988. Democrats are the majority political affiliation in all four voting wards, and there are more registered Independents than Republicans in the City. There are five public schools, one private school, one college (the University of Maine at Augusta), and two public libraries in Augusta. Farrington, Gilbert, Hussey, and Lincoln are the four public elementary schools that are spread throughout the city. Cony High School is the public high school that serves students in grades 7–12 from Augusta and the surrounding towns. St. Michaels is the private Catholic school that children from Augusta and surround towns may attend for tuition. Augusta is part of the Portland television market, and receives most of that market's channels. WCBB channel 10, licensed to Augusta, is the local television outlet for the Maine Public Broadcasting Network. George Huntington Hartford owned the Great Atlantic and Pacific Tea Company, the country's largest food retailer at the time of his death. ^ "City of Augusta, Maine". City of Augusta, Maine. http://www.augustamaine.gov/. Retrieved August 26, 2012. ^ a b "US Gazetteer files 2010". United States Census Bureau. http://www.census.gov/geo/www/gazetteer/files/Gaz_places_national.txt. Retrieved 2012-11-23. ^ "Population Estimates". United States Census Bureau. http://www.census.gov/popest/data/cities/totals/2012/SUB-EST2012.html. Retrieved 2013-07-05. ^ a b Maine League of Historical Societies and Museums (1970). Doris A. Isaacson. ed. Maine: A Guide 'Down East'. Rockland, Me: Courier-Gazette, Inc.. pp. 148–152. ^ Coolidge, Austin J.; John B. Mansfield (1859). A History and Description of New England. Boston, Massachusetts. pp. 38–42. http://books.google.com/books?id=OcoMAAAAYAAJ&lpg=PA9&dq=coolidge%20mansfield%20history%20description%20new%20england%201859&pg=PA38#v=onepage&q&f=false. ^ "May in the Northeast". Intellicast.com. 2003. Archived from the original on 2007-04-29. http://web.archive.org/web/20070429165729/http://www.intellicast.com/Almanac/Northeast/May/. Retrieved 2007-04-29. ^ "NowData – NOAA Online Weather Data". National Oceanic and Atmospheric Administration. http://www.nws.noaa.gov/climate/xmacis.php?wfo=gyx. Retrieved 2012-01-03. ^ "American FactFinder". United States Census Bureau. http://factfinder2.census.gov/faces/nav/jsf/pages/index.xhtml. Retrieved 2012-11-23. ^ "REGISTERED & ENROLLED VOTERS - STATEWIDE". November 6, 2012. http://www.maine.gov/sos/cec/elec/2012/r-e-active.pdf. Retrieved 23 March 2013. ^ Levinson, Marc (2011). The Great A&P and the struggle for small business in America. Hill and Wang. ISBN 978-0-8090-9543-8. ^ "Medal of Honor recipients". United States Army. Archived from the original on November 10, 2010. http://www.history.army.mil/html/moh/indianwars.html. Retrieved November 19, 2010. This page uses content from the English language Wikipedia. The original content was at Augusta, Maine. The list of authors can be seen in the page history. As with this Familypedia wiki, the content of Wikipedia is available under the Creative Commons License.